Actually, at the moment I think I'd be tempted more by a K3iii than a K1ii. Still no sign of a K3ii replacement though, unfortunately. I must admit, I am there with you . A new APS-C flagship for my sports/wildlife stuff would be very interesting to me as well. I can't imagine it being particularly cost prohibitive. CRKennedy aside from being a distributor of stuff is also the repairer of said stuff (from their Melbourne office). So they'll be the ones doing the replacement and not outsourcing anything - they'll get everything direct from the manufacturer. It will run from 21st May to 30th September & will cost $700 AUS. Please check the Pentax Australia web site for updates. Thanks Tas, thats a bit better than the A$800 i estimated...its plus the freight cost to send and receive the package i'd imagine?Insurance in transit is a must. Interesting that there is a prescribed end date. The cost is not out of line with other jurisdictions. Something to think about. No freight costs for me; my car actually knows the way to CRK by itself by now. Very handy having the Pentax agent so local. That $700 is the official line, maybe you can take it into your local dealer (?) to avoid shipping and insurance costs? I'll wait and see what the reviews are like before deciding on this offer. It's not a small lump of change $700 dollars. There will be an announcement shortly. Thank you. its plus the freight cost to send and receive the package i'd imagine? No idea mate, never thought to ask. I can drive over to the CRK office so didn't think about it. I'd image postal costs would be on top of that though. Interesting that there is a prescribed end date. There's a prescribed end date for the service overseas and the time frame quoted matches them as well. Makes sense as they'd be wanting to sell new cameras instead I've have thought. I'm guessing that's equivalent to the US$500, hence the AU$700. It took two weeks to get a simple response as posted above so maybe some of the details are being put together still. Will be keeping an eye on the Website for the updates, if I do get to send my camera in for the upgrade I reckon I'll aim for the last month or so to give me time to squirrel some pesos away. I'll be keen to see the reviews too before parting with my cash. I wouldn't upgrade for Pixel Shift but as I'm often shooting canine events under flood lights any improvement in high ISO output is welcome. I'll usually be shooting these events with the 70-200 f2.8 at ISO 5000 or 6400 and f4.0 or f4.5 at about 1/160 or 1/200sec. I don't even bother with movement shots under those lighting conditions so it's just when dogs are presented to the judge. I was expecting $900 given how most tech items seem to get whacked with that little bit extra here so at $700 it will be more enticing. Would have loved to see a replacement for my k-3ii as well but I'm in no rush so it'll continue to get a good workout as well. A full weekend of shows will often mean 6,000 to 7,000 images especially if I'm also trying to capture movement shots (day time events). Here's where I'd really love a deep buffer and fast clearing. There is no way that you can time exactly the proper foot placement of a dog on the move and unless the foot placement is in precisely the proper position the image is useless. You have to shoot in bursts and hope that you get at least a frame or two that are useful. The buffer will usually be filled just trying to get a movement shot of the 1 dog and most of the time it hasn't cleared by the time the next dog is asked by the judge to gait around the ring. I know there are models in other brands that would probably suit this style of photography more as well as for my bird/nature photography but I've had Pentax cameras since the Super A in the early 80's and I'm hardly likely to change now. Most things I'm happy with just a couple of niggles that I work around... oh and wider coverage of the frame with the AF points is my other wish list item. Looking forward to the hands-on K-1 mkii reviews in the coming weeks and then it'll be working out when I can do without my unit. Hopefully it'll be a reasonable turnaround. Last edited by pqberger; 03-08-2018 at 11:16 PM. So the Upgrade is A700 +gst =A770 plus INSURED freight if you cant deliver it to an agent in a capital city. As opposed to A2799 new for the K-1ii retail price(just came through my Facebook feed). Pity Australian Pentax owners don't get the same Pre-order Deal with FREE GRIP like the US did. But if you notice our price its same as on release in 2016,the silver K-1 can be had on Ebay with grip for A$2749. 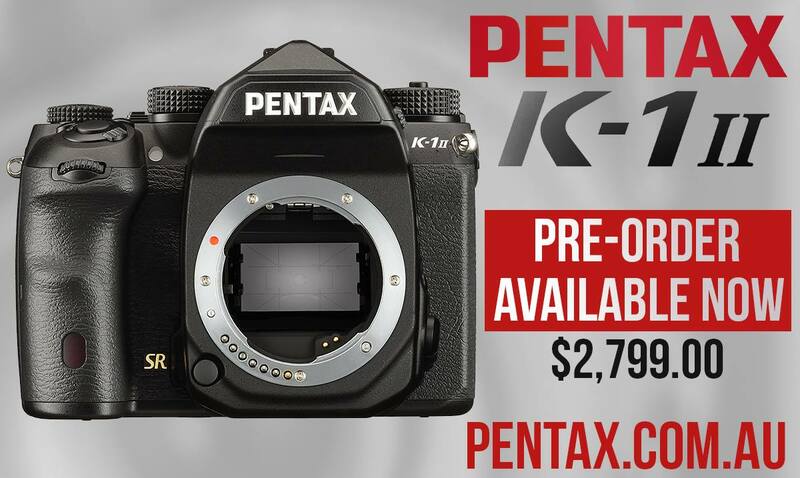 Great news for all Australian owners of the K-1 - we can now confirm the price and timeframe for those looking to upgrade to the latest model - the K-1 II! Starting shortly after the release of the K-1 II, we'll be offering an upgrade path for existing owners of the previous K-1 model for just $700 AUD from May 21st until September 30th 2018. Dont believe anything you read online, Why dont you ring them and get told its A$770 "approximately"